Notes: Dartmouth Castle is one of a pair of forts, the other being Kingswear Castle, that guard the mouth of the Dart Estuary in Devon, England (grid reference SX885503). A small fortalice (coastal fort) was built in 1388 under the direction of John Hawley (rumoured to be the basis for the Shipman in Chaucer's Canterbury Tales). The present Guntower building is the earliest surviving English coastal fortress specifically built to carry guns. It was built by the corporation of Dartmouth between 1481 and 1495 and additions, including open-air gun platforms, were made during the 16th century by Henry VIII and again in the 17th century in order to accommodate new military technology. During the Civil War it was besieged for one month and then taken by the Royalists, who then constructed an earthwork fort above the Castle at Gallant's Bower to protect its landward side. After being held by them for three years it was attacked and taken by Sir Thomas Fairfax for the Parliamentarians in 1646. The castle continued in use as a working fort until the nineteenth century, when it housed no fewer than five huge 64-pdr cannon on traversing carriages. The 19th century Gun Battery is the most substantial remaining part of the castle and itself remained in military use throughout the First and Second World Wars, overlooking the D-Day preparations in the latter. The castle comprises two linked towers - one round and one square � and sections of wall, the whole of which is built upon a rocky promotory, very close to the water's edge. A church, St Petroc's, is immediately adjacent to the structure. 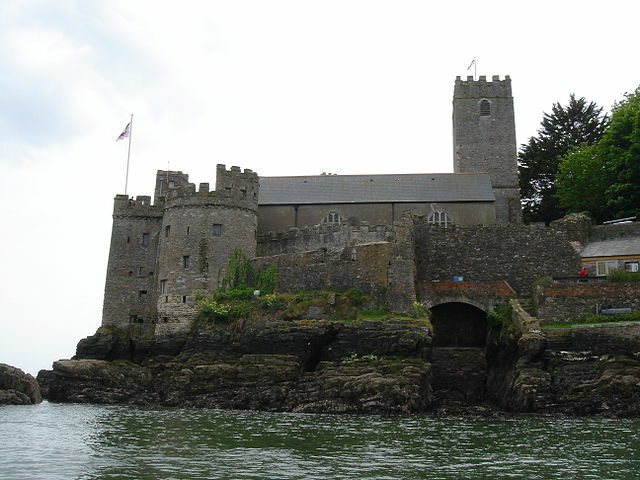 Dartmouth Castle is now in the ownership of English Heritage.